At Donorbox, we understand that nonprofits have busy schedules. Zapier can help you automate your tasks and integrate with other apps to simplify your work. This means no more wasting time on repetitive assignments, so you can get back to the important stuff. Let’s take a look at how Zapier and Slack integration can help you manage your nonprofit tasks. First and foremost, you’ll need to sign up for a Donorbox organization account. After you’ve registered, go to your account settings and select the API & Zapier Integration tab to create an API key that will connect Donorbox and Zapier. Be sure to write your API key down somewhere safe as this will only be shown once for security reasons. Then, log into Zapier to start configuring your zaps! 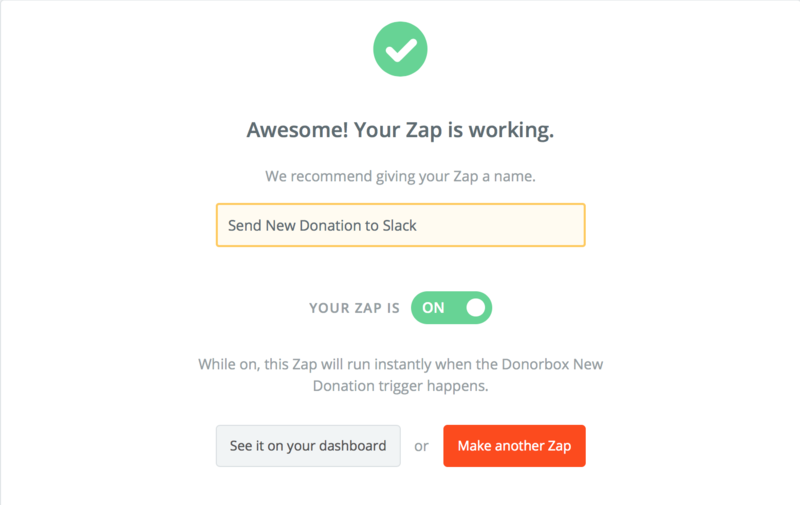 Zaps will trigger Donorbox events (such as whether you have received a new donor or donation) to your Slack account. After selecting a trigger, click the Connect an Account button to connect Donorbox to Zapier. In the popup authentication page, enter your username (your organizations email) and your API key to allow Zapier to access your Donorbox account. Once you have finished, in Choose an Action App, search for and select Slack. Once Slack has been selected, you can choose an action to send any new Donorbox information to your Slack account. Among others, this includes sending a direct message, sending a channel message, or adding a reminder. In the Message Text and other fields, there’s a plus icon to the right of the text field that will allow you to add content using the data retrieved from Donorbox. Once you’ve filled in your template, you can click continue to carry on, then click Finish. Once done, name your Zap and then enable it to make it go live. You can test the integration by making a donation on your Donorbox account to see the transfer of data between Donorbox and Slack using Zapier integration. 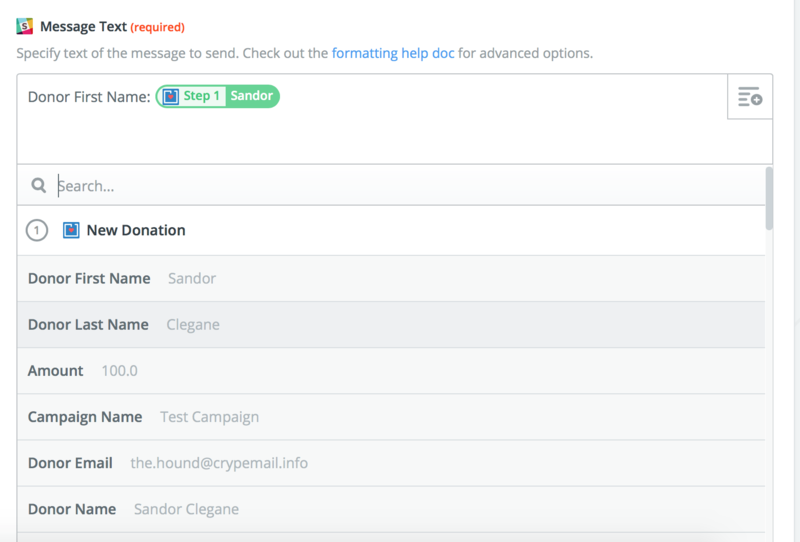 Get started right away with this Donorbox + Slack integration with this templates. That’s it! Now, thanks to the help of Zapier integration, you can receive new information from your Donorbox campaigns directly to your Slack account.